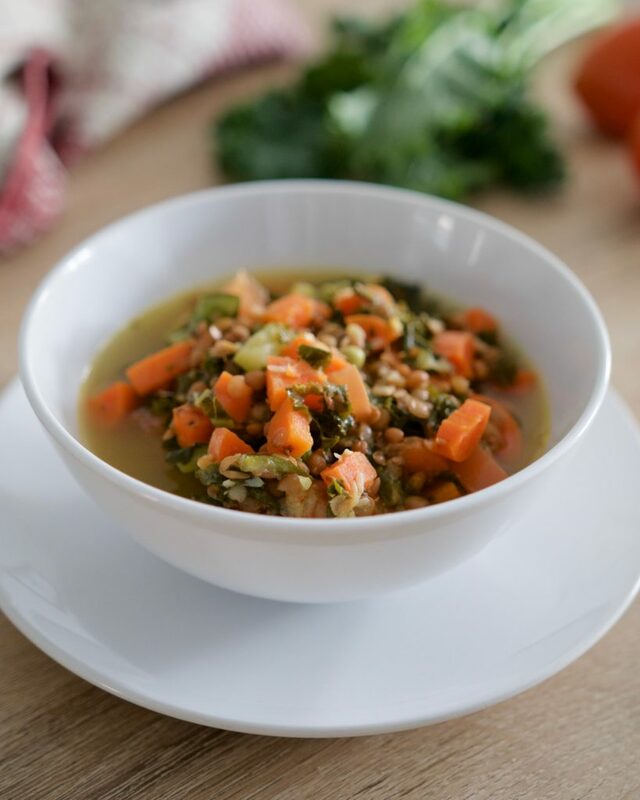 This Garden Vegetable & Lentil Soup is the ultimate warming, nourishing winter recipe. Great for using up veggies in your fridge and even better for leftovers through the week! This time of year all I want is soup. And these days in particular I’ve been craving all the vegetables which is how this soup recipe was born — a desire for the heartiest, most vegetable-y soup there is. This soup is entirely plant-based and loaded with protein and minerals thanks to the green lentils. Legumes are typically not a large part of my diet because I have IBS (plus beans are usually very high FODMAP), but canned green lentils are usually better tolerated as their harder-to-digest sugars are leached out from the water they sit in. So, I do enjoy some green lentils here and there! In my opinion, soups and stews are hard to mess up. My favourite thing about them actually is that I can just throw stuff together, let it simmer, and it usually turns out pretty well. If I need to add some extra sea salt or dash of herbs, that’s an easy fix. However, it’s handy still to follow a proper recipe. I also discovered recently that this soup, and most vegetable soups, need tomato to really bring the flavours together. If you’ve ever had Campbell’s vegetable soup you may know that tomato is a key ingredient! 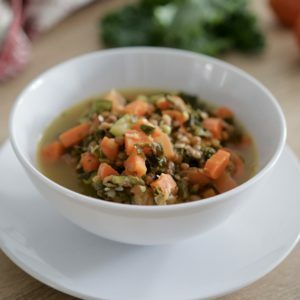 Normally I just use water when I make my soups and stews which you can totally do for this recipe, but I’m listing it with vegetable broth for some added flavour. You can also use bone broth instead for some extra protein, collagen and minerals. Yep! Feel free to play around with different vegetables for this soup. 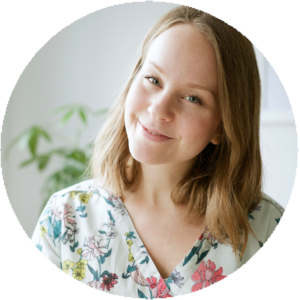 I’ve created this recipe with my personal favourites that pair together nicely, but other veggies like potato, green beans, parsnip or butternut squash will work too. Since this soup isn’t slow-cooked or simmered for a long time (only about 20 minutes or so) you don’t have to worry about things getting too mushy. 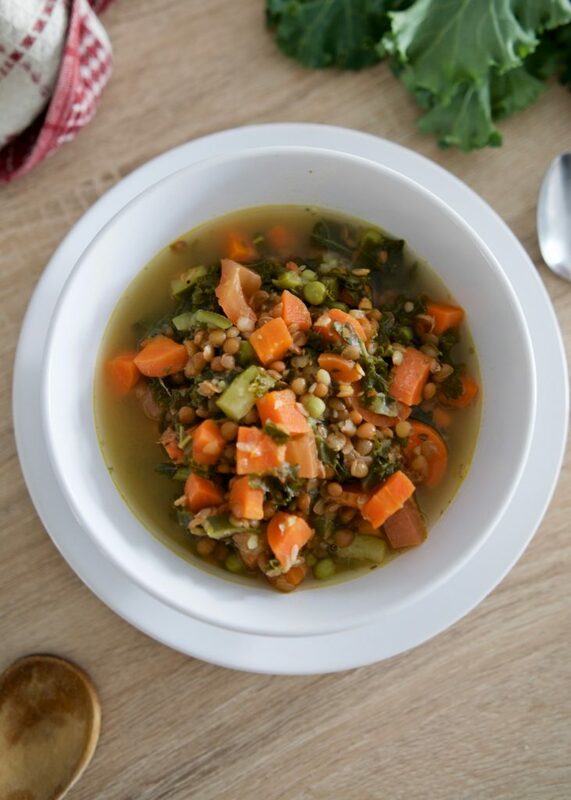 A hearty garden vegetable soup made with protein-rich lentils and delicious veggies. Dice and chop up all vegetables and add to large soup pot. Add in frozen peas, green lentils, herbs and broth. Stir. Bring to boil and then simmer over medium-low for about 20-25 minutes until veggies have softened but aren’t mushy. Transfer to bowls and let cool slightly before eating. Enjoy! Feel free to use other veggies that you like. To store, let soup cool and transfer to glass container or mason jar. Refrigerate for up to 1 week or freeze for up to 3 months. I hope this soup warms you up! Let me know if you give it a try by leaving me a comment below and sharing your photos on Instagram. You can tag me @meghanlivingstone. Yummy! My kids loved it too. Absolutely stunning! We crumbled a spicy falafel on top and have some ready for lunch tomorrow….again so simple to make, but really filling and satisfying.